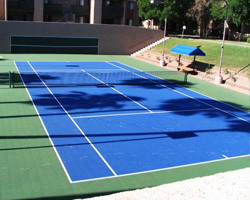 If tennis is your game, our all-weather tennis surface promises to give you the home court advantage. Validation of our tennis surface comes from many channels, including the fact that they are ITF and USTA approved and endorsed by Wimbledon and U.S. Open doubles champion Jonas Borkman. Pursue perfection in your game on a surface the International Tennis Federation (ITF) has rated medium to fast and perfect for backyard or competitive play. 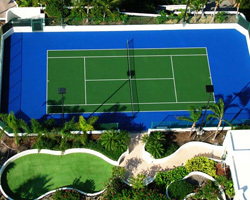 Our tennis surface is available in a variety of appealing colors and has a 25-30 year life expectancy. That's a lot of tennis, and you'll play every set with the peace of mind of knowing your court comes with a 15-year warranty.